Here is my experience owning the Blizzard Pearl XSE for the first week. I love it! Just so u know I'm coming from a 2006 volvo wagon. My gas tank was full from the dealership and I have used half a tank, with my other car I would have used a full tank in a week that would have cost me around $60 Canadian to fill. The Rav does not start up in EV mode in the morning initially it takes time to charge the battery first before switches to EV around .5km it will stay in EV mode if I don't go over 40km/h and I have touched the brake a couple times to regenerate. 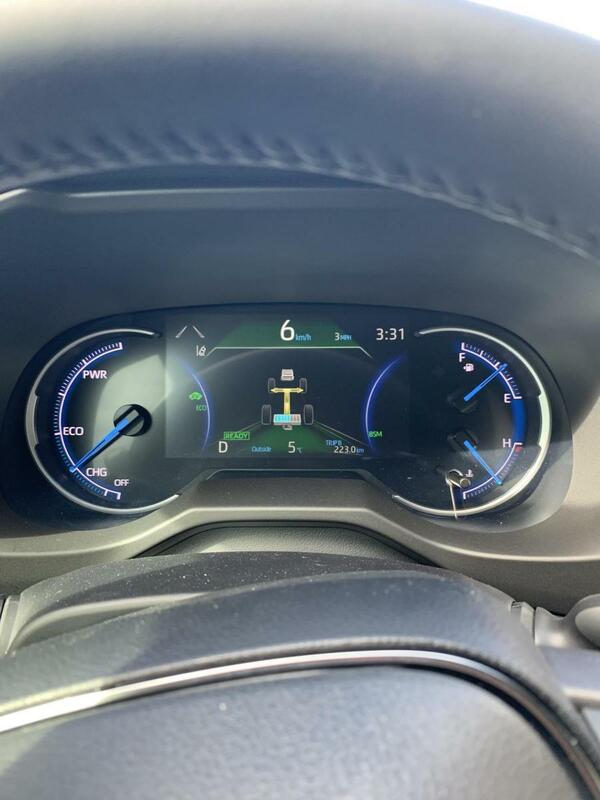 So I realize now that the EV mode does not stay on for 2km I thought it did in first drive but it was the eco mode icon it showed. You do have to train yourself how you step on the gas pedal to maximize your EV mode efficiency. If i turn on the heat it will need longer to charge battery and the ICE will kick in. I do notice if i park the car while at Train station before wife gets out the car the ICE will start for the heating to stay on as the battery cannot power it only. I notice there is a eco mode for heating or AC but not sure how that works yet. The heat is not particularly fast to get going and needs the fans way up to feel it initially and make sure the venting is opened correctly on dash. The heated seats on high are not very warm compared to my old car, not sure if it's the softex seat - it just feels a little warm, the Steering wheel definitely is warmer feeling in the 10 by 2 position and 7 by 4 positions. The displays are good. I found them very distracting at first coming from no electronic display in old car. So much going on - u have to adjust them to your liking and there is lots of options. I just turned off center display now for time being to listen to sound of car. I wish the there was large digital numbers for your speed in display behind steering wheel option which I couldn't find. It's neat the colour changes for sport, eco and normal mode. The lane change assist sure is neat have not tried the adaptive cruise control yet because i have not been on highway yet but this weekend I will be. I was able to negotiate my front tints included for free with my deal and it sure looks good with the black roof. The Rav did come with all mudflaps and winter and summer mats. I wonder if this is the case with other countries models or if not does this makes up for no Panoramic moonroof in Canada? I have a miniature schnauzer dog who has no problem jumping in and out of vehicle and his paws does not seem to be a problem for Softex and he loves that the back windows do lower all way down into door. covers camera for that and reverse camera. I wish those fugly warning stickers on sun visors was removable - it does nothing for inside styling to constantly be reminded Warning for Airbags - I will put a black sticker over it. Also the warning lights for the airbags light below the heating dials are so unnecessary in my opinion and a waste of lights. Also the SRS stickers in front window panes, why its 2019. The steering wheel feels well in hand and adjusted it closer to dash. The connection to the road feels appropriate not to soft or heavy. I also like how wide the gas and break pedal are. The vehicle does get up to speed fas in comparison to older car and you could easily go over the speed limit of 60 or 80 without realizing. Engine noise? What engine noise? If you step on the gas I want o hear it! There is a hum while driving in EV mode I like- reminds me of KIT in Knight Rider! So was KIT a EV car? Now you know my age! While in reverse you also hear a unique sound. Which is cool. We also have to remember this is also not a luxury class car. We can't have expectations for more when we didn't pay for that. This is a middle ground ride suitable for those who just want basics in a comfortable reliable package! All in all I am loving the RAV4 hybrid so far - this really feels like a 2020 car! Wonder why it wasn't just introduced as that instead of 2019 - wonder how people perception for that will effect sales hmmm anyhow I will give a follow up review for 2 weeks and try to get back here for any follow up questions. Edit: I believe I’m wrong, I think the 7” display might be in XSE’s also. 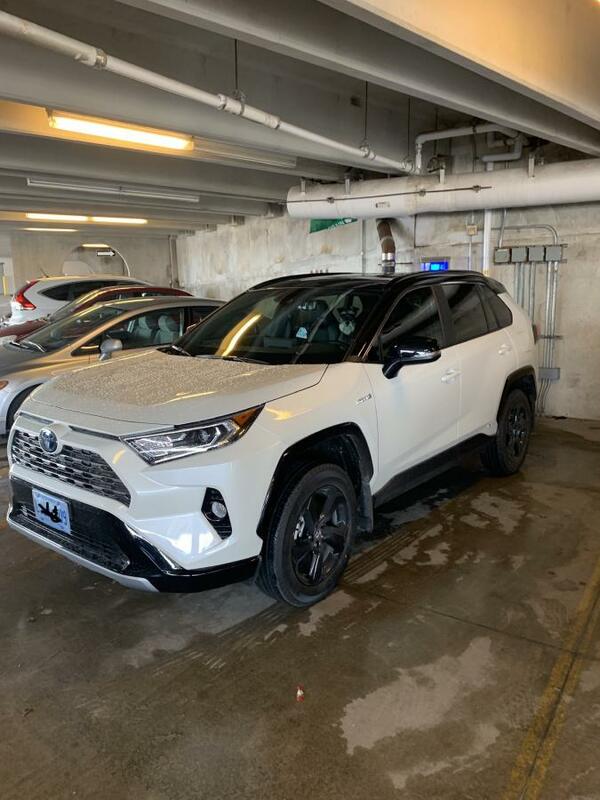 Ordered a 2019 RAV4 Hybrid AWD (XSE HV Premium) in Zircon Silver / Attitude Black. For now my Black-and-Blue 2018 C-HR Hybrid Bi-tone Premium will do. Thanks, just did it! Pic below. Now, wouldn't it also be nice to see a hybrid version of both. I did put a light blue license plate cover on, i think it ada a pop to the blue from decals, shocks, blue stitching and inside lighting! I also have to get use to how quiet engine is when i park car to remember to push button to turn off. Luckily the car will not allow u to lock door with engine still running once you get out. I need to read manual now to see how to unlock all doors before entering car or using key fob if there is a way. I believe pressing the unlock button a second time within a few seconds of the first time will unlock all of the doors rather than just the driver's. You can also ask your dealer to change the settings so that the fob will unlock all doors from the first keypress. In addition, you can place your hand inside the door handle and leave it there for 2 seconds to unlock the rest of the doors. I'm in Toronto so yes would love the new blue plates, and too bad we didn't get rid of front plates at same time. The cars personality would sure shine more if we didn't have right! Is the front side windows tinting that the OP got from the factory or dealer installed? I'm wondering if it's tint film or it's the same privacy glass that is used for the rear windows. I thought in Ontario it's illegal to tint the front side windows. That would be aftermarket tint (dealer installed or not), and yes it is illegal in most of Canada. Most any shop will still do it, it's up to the end user to pay the fine if/when they get ticketed for it. 22 Attachment(s) Mods to RAV4?